China has stopped exports of another New Zealand milk product after it was found to be contaminated. New Zealand officials said Monday that none of Westland Milk products, accused of breaching the acceptable levels of nitrate, had reached consumers in China. New Zealand’s Ministry for Primary Industries (MPI) announced that it had revoked export certificates for four consignments of lactoferrin, made by Westland. An official statement said officials from MPI, the ministry of foreign trade and Westland Milk Products are “working closely with the Chinese authorities on this issue”. “MPI’s technical experts have looked closely at this issue and believe any food safety risk to Chinese consumers is negligible because the quantities of lactoferrin used in consumer products was very small, meaning the nitrate levels in those products would easily be within acceptable levels,” MPI acting director-general Scott Gallacher said in the statement. MPI had sent a team to the Hokitika factory to investigate the contamination after which the export licenses were revoked. “The consignments exported to China were accompanied by official export certificates stating that the product complies with New Zealand and China’s regulatory requirements. This was based on testing of composited batches undertaken at the time of manufacturing, which showed no issue. We now know that is not the case and certification has been withdrawn,” Gallacher said. Westland Milk Products said all the affected products had been traced and quarantined. Chief executive Rod Quin said routine testing prior to export had failed to identify the problem. 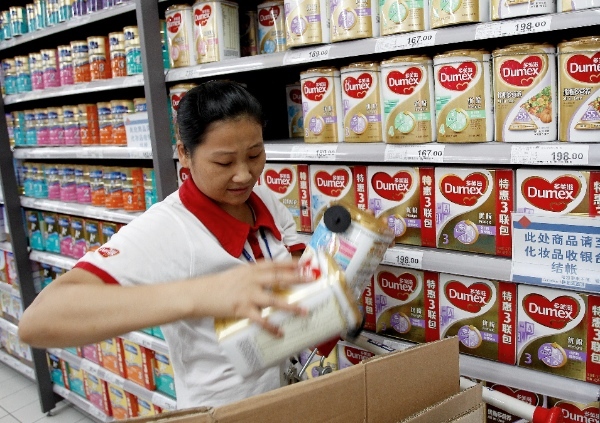 Earlier this month, China banned some Fonterra products after the New Zealand firm was embroiled in a separate milk powder contamination scare that has led to product recalls in China, Hong Kong and elsewhere in Asia. China had issued record fines of 670 million yuan ($108 million) for six dairy companies on charges of price-fixing in August, including Fonterra.